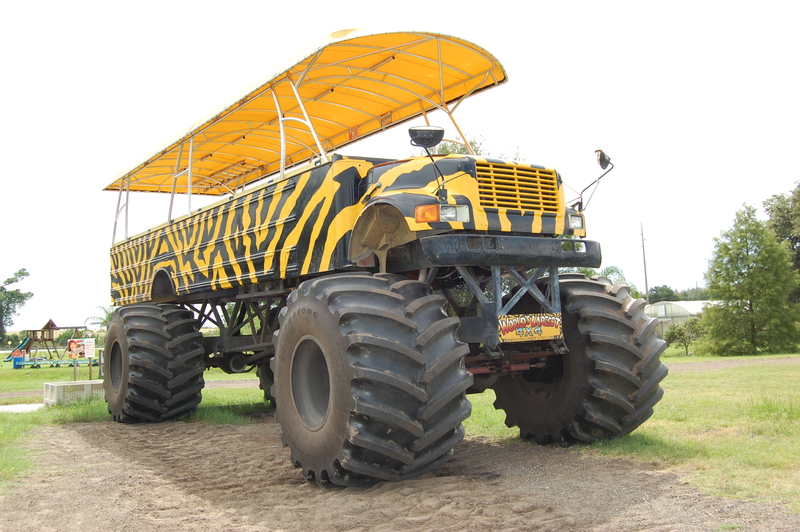 CLERMONT & ONA, Fla. – Of all our planned roadside attractions, the monster-truck eco-tour was the one I was most looking forward to: a 45-minute tour of a cattle and citrus farm, seen from the world’s largest 4×4. I’ll spare you every delightful detail (“We have 350 cows and just seven bulls, each of them named L-L-L-Lucky.”) through mud and sand and across cow paths, past gators and banana spiders and into an angry thunderstorm that nearly drowned out our chipper guide, Chris. Florida is all about the thunderstorms. As on the Prairies, you can see it coming. You have a few minutes or half an hour to prepare, tighten your seatbelt or take cover. Often you can see patches of lbue sky in the black cloud and you just hold on and hope the wind is in your favour. Solomon’s Castle appealed to each of us. Trevor, because he’s pretty much up for anything, Melani because it’s a castle, and me because it’s made from discarded objects including old printing plates. Our GPS, Alpha, loved it because it meant he could take us on back roads and threaten to get us lost. The rain tapered off as we pulled away from the monster truck. We drove along the wide highway for a bit, past fruit and gator-meat stands, a gas station and a strip mall before turning left onto a well-maintained side road. Citrus groves were interspersed with fields of cattle. I’d never thought of Florida as cow heavy, but with 1.1 million head of cattle, this is the third-largest beef-producing state east of the Mississippi. Trevor spotted the herd of deer in some scrub on the other side of the ditch. “I bet the citrus farmers love these,” I said sarcastically and wondered whether the fences were good enough to keep them at bay. Moments later a deer with huge black eyes nodded as we went past. She was on the orchard side of the fence. Farther along, two wild boar dodged out of the ditch and into the tall grass. “Ahead, turn right,” Alpha instructed, putting us on a narrower road where the trees creeped closer to the asphalt. The clouds had somewhat lifted and we couldn’t see lightning any longer, but the low growl of thunder penetrated the closed windows. The car was very quiet. The trees fell away, opening to an empty field ringed by an uneven fence and more than a dozen dark silhouettes. My foot lifted from the gas pedal. The buzzards turned as one to watch us approach. One lifted his head, as though he were about to speak. We were almost past them, my head turned sideways because I would not look away. “Turn right now!” Alpha commanded and my foot, which had hovered over the gas, came down hard on the brake. The buzzards lifted, disappeared. And, yes, the next road was narrower still, pitted and uneven. Branches hung over us from both sides, Spanish moss reached toward the windshield; the road curved. A faded sign promised Solomon’s Castle just ahead and – here! – the white gates. We finally approached. Solomon’s Castle. Reopening in October. Bet it’ll be spectacular.